Just LOVE these colors! Right now these *POPULAR* Fav Bella Tri-Blend | Boyfriend Fit + Adult $8.99 (Retail $16.99). 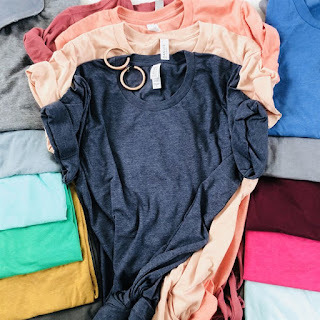 Soft, comfortable tri-blend ladies fit tees in GREAT summer colors! This basic comfy tee is great to wear as a casual top to the beach, pool or Pair it with jean cut off shorts and sandals for a casual daytime look. You will want one of every color and will be a favorite to wear! Perfect comfort for Spring &amp; Summer days! $3.89 for the first item and $1.50 for each additional item. US only. Seller usually ships within 7 business days. Ships no later than Tue, Nov 27.